all proceeds to go Common Pantry. 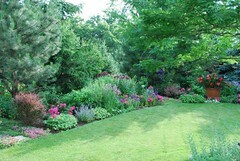 The NNA Garden Club invites you to take a day trip with us to Lake Forest for a visit to Ten Arbors Garden. 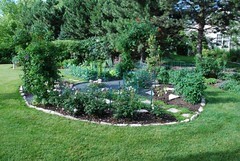 Lynn and Clay Pruitt built their custom Ten Arbors Garden and home in 1999. 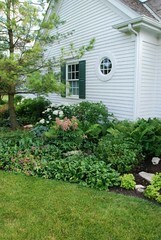 Since then, the arbor theme continued to grow and currently contains ten arbors. Currently there are crab trees, pear trees, spruces, Japanese Maple, Autumn Purple ash, and a honey locust. In addition to the spectrum of trees, Ten Arbors features lush gardens showcasing roses, perennials, vegetables, bushes, and stonework. Despite the challenges brought on by poor soil quality, drainage issues, and fungal growth, Lynn and Clay have found ways to maintain their beautiful space for the past fourteen years. Both now in their seventies, the Pruitts are tenacious gardeners with a passion for sharing their knowledge and Ten Arbors with others. Attendees will carpool from Northcenter to Lake Forest and should bring a dish for a potluck lunch at the garden. Cost to attend is $5 for NNA members and $20 for non-members. All proceeds will go to Common Pantry. Carpooling information and driving directions will be provided after sign-up. You must register by Friday, September 13th.